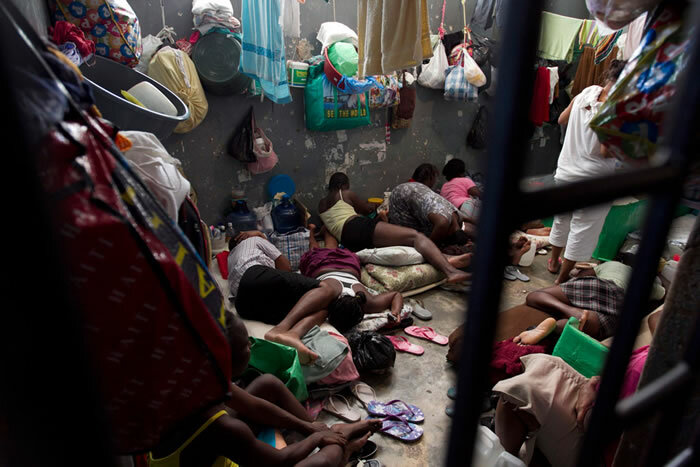 Here is a picture showing the status overcrowding at Haitian prisons. As per MINUSTAH and the Institute for Criminal Policy Research statistics of December 2015, considering an estimated Haitian population of 10.78 million, prison population rate per 100,000 in the country is 102. Haiti has an official capacity of 2,431 inmates in its 17 prison systems; however, the number of 11,046 detainees translates the occupancy rate to 454.4%. The country boasts the worst overcrowding in the world. The prisoners rarely get any recreational time. They sleep, eat and live in about the space of one-quarter of a twin bed (0.4 square meter space) whereas the international recommended standard is 5.4 square meters of space. Some of the major reasons of overcrowding might be due to the snail-paced legal system, prolonged pre-trial detention (share of pre-trial detainees is 70.9% of the prison population), lack of qualified health personnel and insufficient budgetary allocations. Large numbers of the prison inmates spend more time in prison than the jail term they receive after trial.